It must have been very shocking for the apostles to hear Christ say those words. According to St. Matthew, Jesus spoke those words very early on in His public ministry — the same day that He chose the Twelve to be His Apostles, he told them they wouldnâ€™t be worthy of Him if they did not take up their cross and follow after Him. It was only much later — maybe as much as two years later — that Jesus began to tell them clearly that He was literally going to be Crucified and Buried and Rise on the Third Day. But before that Revelation, those first disciples would have had a very different view of the Cross than we do. Today, seeing a Crucifix invokes in us Christians feelings of how much God loves us. The crucifix is what we turn to in tough and tragic times of our life. We hold the crucifix thatâ€™s on our Rosary when we pray the Rosary and it is a comforting thing. We hang crucifixes prominently in our homes, we kiss the crucifix as a sign of devotion. And can anyone imagine what this Church would be like if we took out the life sized Crucifix hanging in back of the altar? After the Lordâ€™s Presence in the Tabernacle, the Crucifix is the most comforting sign of Godâ€™s love in this building. But for those twelve apostles listening to Jesus in todayâ€™s Gospel, seeing a Crucifix invoked none of these feelings whatsoever. The Cross for them was a symbol of oppression and cruelty. The Romans had invaded Israel and taken it over against the will of the Israelites. Rome was cruel enough to her own citizens, but to conquered peoples like the Israelites she was ultra cruel. History tells us that when Jesus was a child, the Roman Army crucified 2000 Jewish men just a few miles away from his home of Nazareth because the Jews revolted against the Roman occupation of their land. Mary and St. Peter and some of the older apostles probably remembered seeing those Crosses lining the main road through Galilee. And so the Cross for the early disciples wouldnâ€™t have invoked pleasant feelings, but feelings of fear, of anger, and of the hopelessness of ever being free. And that is why Christ says to them Whoever does not take up his cross and follow after me is not worthy of me. Whoever does not take up his fears, his anger, his hopelessness and follow after me is not worthy of me. Jesus is telling us that thereâ€™s no thing in this world that should terrify us to the point of inaction; Thereâ€™s no person or persons in this world that should anger us to the point of hatred; and finally thereâ€™s no situation we can be thatâ€™s so hopeless we should despair. Rather if we face those fears and carry them to Jesus, and if we bring that anger in us and place it before the Lord, and if we trust in Jesus despite the terrible circumstances and overwhelming odds, Jesus will deliver us disciples of His. While we thankfully donâ€™t live today under a foreign government that publically executes people who disagree with them, we still have things in our lives that frighten, anger and discourage us. We can find all three of these things in the family we are part of. We fear losing those family members that are most dear to us, we fear that something bad may happen to them. Other family members anger us to the point that we canâ€™t forgive them, and our anger is affecting our health and well being. Still other family members are going through tough times, and we wish we could help them but there doesnâ€™t seem like thereâ€™s anything we can do for them. Jesus says to us “put Me before all your family members, love me before you love them, and everything will work out.” But “He who loves mother or father, son or daughter more than me is not worthy of me” — I canâ€™t bring all the many graces I have for those family members you donâ€™t place before me. In this Year of the Eucharist, we are especially mindful of the teaching of Holy Mother Church that every Mass is a re-presentation of the One Sacrifice Jesus offered on the Cross on Good Friday. And so as we gather here for Mass this weekend, all of us here present have at least been obedient to the first half of Jesusâ€™ command in todayâ€™s Gospel. All of us have at least “followed after” Christ, have followed Him all the way to Calvary, here on this Altar. Hopefully all of us have been and always will be obedient to the second half of Christâ€™s command. Hopefully we have all taken up our Crosses and carried them behind Jesus to this Altar of Sacrifice. Preached June 19, 2005 (Father’s Day) at St. Joseph Church Woonsocket. On God the Father. 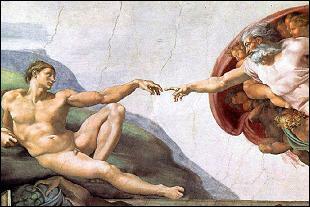 As today is Fatherâ€™s Day, I thought I would give a homily on God the Father. We Christians are really unique among major world religions, in that our preferred name for God is “the Father”. Even the Jewish religion rarely refers to God as Father. An interesting experiment is to take your Bible and search through the Old Testament for passages where God is called “Father”. Youâ€™ll probably give up after about 15 minutes because in over 900 pages of Old Testament, God is called “Father” only about 4 times. For the Jews, Godâ€™s name is spelt YaHWeH, meaning “The One who Is.” That name of God is so Holy the Jews feel it is sinful for a human to pronounce it, so they say “Adonai” or “Lord” in place of His name whenever its written in Sacred Scripture. (Actually in most Catholic Bibles, the word LORD in capital letters is written in place of Yahweh out of reverence for God’s name in the Old Testament). So the Moslems worship Allah, the Jews Adonai, but we Christians worship the Father. We believe that Father is the best name for God, that Father most fully reveals who God is. Now, some people think that in our Modern World the Church should shy away from calling God “Father” as thatâ€™s very sexist and chauvinistic. But before we do that, who began this business of calling God “Father” anyway? Well, Jesus did! And He specifically told His disciples to call God “our Father.” And while we do believe that men and women are equal in dignity and are both created in Godâ€™s image, we also believe in the mystery of God the Father. And all of the 27 Books of the New Testament except for the 3rd Letter of John refer to God as “Father”. To throw out or downplay that name for God would be to throw out and downplay the example and command of Jesus and the New Testament writings. If we look at those many New Testament passages which refer to God as Father, there are two interesting things about them. That is because God is really Jesusâ€™ Father, He is the Son of God, begotten from all eternity by the Father. “He who sees me sees the Father” says Jesus. On the other hand, God is our Father only by adoption. In Baptism we ceased being children of Adam and became adopted children of God. Which means we reflect God the Fatherâ€™s image only if we choose to turn away from the sinful ways of our father Adam and turn towards Jesus the new Adam. So we here present who are fathers need to model ourselves after God the Father. By the way, God is not the only father Jesus speaks about in Scripture. He also teaches us that Satan is a father as well. Jesus calls Satan the “father of lies” and father of the Pharisees. We fathers certainly donâ€™t want to imitate that daddy! And may each one of us baptized children of God fear no one or no thing in this world, because Jesus our Brother tells us that our souls and bodies and even every hair on our head is precious and constantly cared for by our good and loving Father in Heaven. At the sight of the crowds, Jesusâ€™ heart was moved with pity for them, because they were troubled and abandoned . My brothers and sisters in Christ, there are so many people out there troubled and abandoned. Troubled by illness, depression, financial hardships. Troubled by violence, terrorism, by family problems. Troubled by their conscience, troubled by all kinds of doubts. Being troubled is bad enough, but how many people there are who are not just troubled but troubled and abandoned. Abandoned by the false gods they put their hope in to save them from their troubles. Some make gods out of money, pleasure, diversions, or career ambitions. Others make gods out of politics, or family relations. Still others make very sophisticated gods out of complex modern ideas and philosophies. And every one of these so-called gods will ultimately abandon those who worship them. What they thought would make them happy and save them from their troubles has abandoned them and left them with even more troubles than before. At the sight of the crowds, Jesusâ€™ heart was moved with pity for them, because they were troubled and abandoned. My brothers and sisters, a follower of Christ is neither troubled nor abandoned. He goes on to write “I am certain that no present thing nor any future thing is able to separate us from Godâ€™s love.” No present situation, no future situation should trouble us followers of Christ. And Christ, the only True God, never abandons us. We can choose to abandon Him and put gods of money or politics or pleasure or family over Him, but Heâ€™s always there to take us back. And if we keep Him over our whole life, if we truly make Him the Lord of our career and our family and our body, He will never fail to deliver and prosper and increase us in ways beyond our imagining. Hopefully all of us here realize this. But there are many we meet every day in the world who donâ€™t know Christ or have forgotten about Christ and so go about very troubled and very abandoned. And as Jesusâ€™ heart bleeds for these lost sheep, so our hearts should also bleed and weep for them. How do we as a Church corral the crowds of lost sheep? Jesus gives only one answer: pray that God calls Christians to be priests, religious and lay apostles. Every day we should all be praying for vocations to come from our parish, especially priestly and religious vocations. But really, God is calling all of us to go after the troubled and abandoned sheep in our neighborhoods and places of work. God calls very ordinary people to do extraordinary things. Just look at the men God chose to be Apostles. I donâ€™t know if you heard about this letter, some people say it might have been found among the Dead Sea Scrolls. Itâ€™s a letter written to Jesus the Carpenter from Jordan Management Consultants. (The Letter reads) Dear Jesus: Thank you for submitting the resumes of the twelve men you have picked for managerial positions in your new organization. All of them have now taken our battery of tests, and we have not only run the results through our computers, but also arranged personal interviews for each of them with our psychologist and vocation aptitude consultant. It is the opinion of the staff that most of your nominees are lacking in background, education and vocational aptitude for the type of enterprise you are undertaking. They do not have the team concept. We would recommend that you continue your search for persons of experience in managerial ability and proven capacity. The two brothers, James and John, the sons of Zebedee, place personal interests above Company loyalty. We believe it is our duty to tell you that Matthew has been black-listed by the Greater Jerusalem Better Business Bureau. Simon the Zealot definitely has radical political leanings; and Bartholomew (A.K.A. Nathaniel) has a tendency to prejudge individuals based on what town they come from. However, one of the candidates shows great potential. Heâ€™s a man of ability and resourcefulness; he is a great networker; has a keen business mind; and has strong contacts in influential circles. He’s highly motivated, very ambitious and adept with financial matters. We recommend Judas Iscariot as your Controller and Chief Operating Officer. All the other profiles are self-explanatory. We wish you the utmost success in your new venture. Jesus chose the Twelve with all their imperfections, and He sent them out to bring back the lost sheep. And by the grace of the Holy Spirit they brought many people to Christ. In the same way, Jesus choses you with all your imperfections, and each week Jesus sends you out to bring back the lost sheep by your actions and words. I think we have all come here this Sunday for Mass (unless some of you just came for the free Air Conditioning!). Well, who knows what the word “Mass” means? It means “the sending forth” — Remember “Ite, Missa est” from the Latin Mass? “Missa”, Dismissed, Go, get out of here! We come here, receive Jesus sacramentally in our hearts just as the apostles once did, and are all “sent forth” into the world to bring hope to the troubled and abandoned in our midst. And with Jesusâ€™ blessing as we go forth, we imperfect sinners have all that we need to gloriously accomplish whatever mission Christ is sending us on. The meeting of Godâ€™s hand with Adamâ€™s hand is so distinct and masterfully done that you sometimes see the hands alone in a framed reproduction on peopleâ€™s walls. What is very interesting about Carravagioâ€™s depiction of the scene is that he paints the hand of Jesus exactly like the hand of Adamâ€™s in Michelangeloâ€™s painting. That is because Jesus is the New Adam. And as the New Adam, Christ stretches out His hand to Matthew and invites Matthew and all sinners to touch Him and receive the spark of New Life. When sin entered into the world, the spark Adam and Eve were given fizzled out to a whimper. We children of Adam and Eve only get a fraction of the spark of life that they got before the fall. But the Good News is that God the Father has sent His Son Jesus, the New Adam, fully charged up with that original spark and then some. And here He is in todayâ€™s Gospel, reaching out His finger and inviting us to touch it and have Life in abundance. Matthew had to make that leap of faith. He had to stretch out his hand and touch it to Christâ€™s. He had to rise from his life of greed and corruption, and follow Jesus. 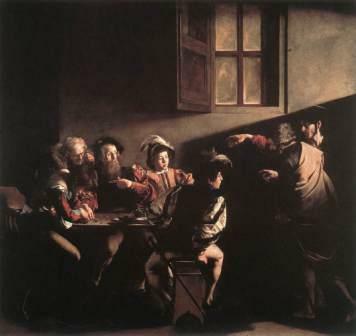 He had to abandon his old unrepentant tax collector friends and take his place at table with those trying to repent of their sins. Matthew of course went on to be an apostle and to write the Gospel of Matthew. But in the beginning of this Gospel heâ€™s still at his tax collector post, holding back his hand, wondering if this man Jesus could really spark life in a person like him. You are currently browsing the fatherwoolley.com blog archives for June, 2005.